The unsurpassed Death Metal monarchs MASTER returns with their eleventh full-length album "The New Elite", an odious showcase of brick-wall musical integrity that has been quintessential MASTER even during the band's early inception. 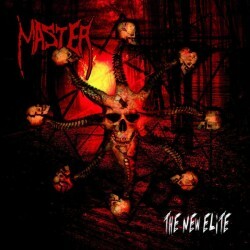 The unsurpassed Death Metal monarchs MASTER returns with their eleventh full-length album "The New Elite", an odious showcase of brick-wall musical integrity that has been quintessential MASTER even during the band's early inception. Now with 30 years on, Paul Speckmann and his insult-brigade have shown no signs on mellowing, but only more hateful than ever! Recorded, mixed and mastered at Shaark Studios (Root, Fleshless, etc) and with the emblematic artwork and layout designed by German graphic artist Mark Bridgeman, "The New Elite" is a bulldozing 45-minute audio-violence of social travesty and political coercion. Vehemently honest and the cruel truth does cut like a knife. This is MASTER! Period.